Anyway...after I saw this picture I became obsessed with creating my own version of this cute denim/crochet combo! I knew in my head exactly what I was looking for, but it proved to be harder to find than I thought it would be! 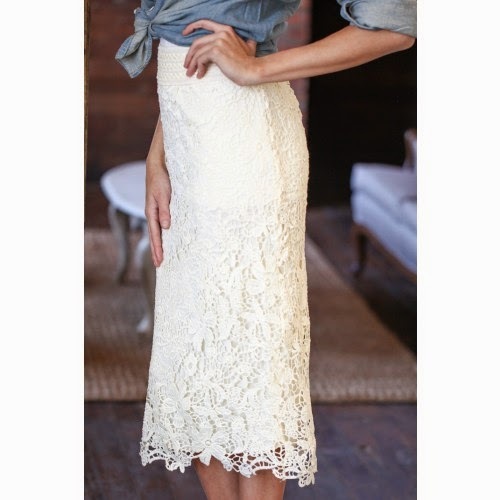 I was looking for an off-white crochet pattern (leaves/flowers) that was a pencil skirt style and could be worn high-waisted...that way I could wear a cute chambray button up and tuck it in or knot tie it in the front. There were cute ones all over the internet, but all sold out! Literally every time I thought I'd found one that worked, they would be completely out of stock! Even the ones I could find were only left in XS...came in the wrong color...or were mini skirts instead of midi. This Forever 21 option would have been perfect...and was only like $22...but alas, it was sold out. Finally, I stumbled upon this Bobeau skirt on Dillard's website. I can't even remember the last time I bought something from Dilliards...maybe 9th grade?! This happens to me all the time, I've always said I need a personal seamstress to create the clothing ideas I have in my head, but can't seem to find in real life! What a great find! Such pretty detailing and I love that it's off white!